Susan Benson with poster collections of some of her Portrait of an Island paintings at Mahon Hall. 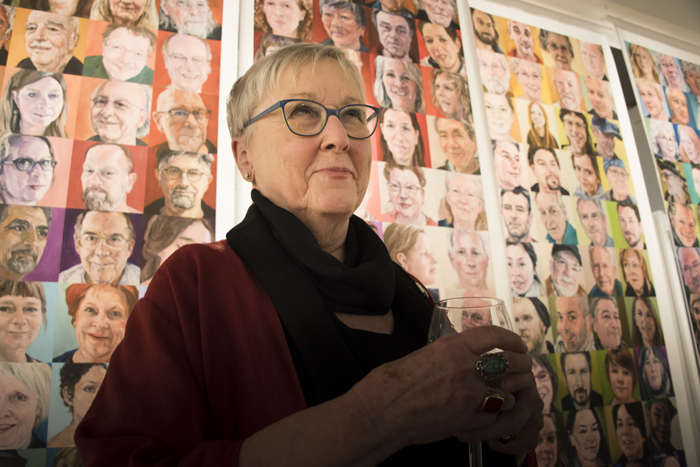 The Salt Spring Arts Council has hatched the perfect Easter Art Show gift for the island this year with its feature exhibition at Mahon Hall showcasing the incredible artistry of Susan Benson. Portrait of an Island fills the main hall space and comprises an impressive body of work that Benson produced over the last couple of years. Close to 170 individual oil paintings, shown in groupings of a dozen or so, reveal such dedicated looking and interpreting on the part of the artist it’s a wonder she ever made it out of the studio. Each component piece is testament to her skill, but the true marvel comes from seeing the entire work as a whole: Portrait of an Island is properly not just the show’s name but the name of one multi-faceted work, which is why the individual portraits aren’t identified. Upstage Centre: Susan Benson – 50 Years of Theatre Design is the second side of the show and can be found on the Mahon Hall stage. This retrospective of Benson’s history at the forefront of Canadian set and costume design explains that she didn’t just drop into the island’s art scene unformed. She has created the entire visual world for major ballets and operas and her costumes have adorned the likes of Maggie Smith and Jessica Tandy. In many cases Benson was working with her husband, the lighting designer Michael Whitfield, so she could be confident her work would be shown to its best effect. The Easter Art Show continues at Mahon Hall through Saturday with daily special events in addition to the exhibition. Noon-hour art talks by Bob Leatherbarrow, Briony Penn and Whitfield are scheduled in succession on April 5, 6 and 7. Benson will give a talk about theatre design April 6 at 7 p.m. The series finale comes this Saturday, April 7 at 7 p.m. with Salt Spring Saturday Night. The evening program features readings, music and more that will be performed mainly by the subjects of the portraits. For more on this story, see the April 4, 2018 issue of the Gulf Islands Driftwood newspaper, or subscribe online.